Experiments now going on in a private laboratory at Pasadena by a youth of 18 may revolutionize the whole theory of gravitation as first deduced by Sir Isaac Newton. 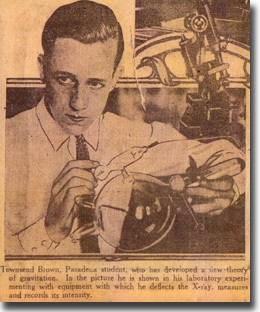 Townsend Brown, a student of 706 Arden Road has conducted experiments since last September which have convinced him that while there is a law of gravitation, the force is caused by a “push” and not by a “pull, ” and development of this theory by practical inventions will revolutionize industry. Young Brown has his laboratory at home filled with expensive equipment to pursue his investigations. He is a normal, serious-minded young man with no false illusions about his mission in life, but with a desire to become a pioneer along the line of scientific research that will open the way for startling discoveries and inventions. In plain words, his theory is this: That ether waves some outside space push from all directions against the earth, and against other objects and planets in space, forcing objects the way the wave extend, instead of drawing them, according to the old Newton theory of gravitation. By means of his equipment he conducts experiments with the X-ray, which is of the same family as light and the ether wave, and by means of which it is possible to test the theory. By means of this machine, he says, that since the X-ray is deflected, the gravity wave, being of the same family, also can be deflected. If this theory is proved so thoroughly that it displaces the Newton theory, inventions of the future will revolutionize human industry, according to the young scientist. By deflecting ether waves that are pushing against objects, man can control weight to such an extent that his deflecting machinery would enable him to lift a battleship out of the sea and set it on dry land. Friends of the Brown family will remember that almost from infancy Townsend has been interested in science and that he was the first person in Zanesville to have a radio, which he installed himself. The word “deflect” may be the key word in that sentence, because it was in the Coolidge tube that Brown first observed the phenomenon to which his name would forever be attached. But it was not the “X-ray” beams that Brown was deflecting. It was the tube itself. The Coolidge tube was the most advanced X-ray device of its time; its basic configuration remains central to all X-ray devices still in use today. The tube is named for its inventor, William D. Coolidge. It is worth also worth noting that prior to developing the X-ray device, Coolidge collaborated with his colleague Colin G. Fink at General Electric to produce a formula for tungsten which greatly improved the quality and durability of incandescent light bulbs in the first decades of the twentieth century. But it was his X-ray tube for which Coolidge is remembered today. The Coolidge tube was unique among early twentieth century vacuum tubes in that its electrodes were highly asymmetrical — there was a tremendous disparity between the size of its positive and negative electrodes. We will likely never know precisely what prompted Brown to investigate this configuration, but it is precisely the properties exhibited by these electrodes, when charged to a high voltage, that he was determined to explore. [Brown] “mounted [the Coolidge tube] in a careful balance, as if it were an astronomical telescope. His idea was to point the tube in different directions and somehow find a variation in the power used by the tube, the strength of the X-rays generated, or something…. [He] didn’t find what he was looking for, no matter where he aimed his apparatus, no tell-tale differences appeared. But he did find something he wasn’t looking for; he found that the X-ray tube generated a thrust, as if it wanted to move…. He soon learned that the new force was not produced by the X-rays, but by the high voltages which they required. Many experiments were necessary to make certain that the force was not one of the known effects of high voltage, and that it is a mass force, like gravity, rather than an area force, like most known electrical forces. What Kitselman is saying here is as simple a concept as it is a radical departure from accepted electrical science at the time. Electricity had long since been proven to have an effect on the space around its circuits, i.e. the magnetic fields that form around any flowing current. What Brown was now asserting was that, in the configuration he was experimenting with in his Coolidge tube, the high-voltages he was applying were having an effect on the mass — the weight — of the apparatus. This was indeed a radical departure from the accepted science of the day, which perhaps explains in some small way Robert Millikan’s curt dismissal of the idea. These experiments with the Coolidge tube, then, are the first indications that Brown had found what he believed to be the physical coupling between the electromagnetic force and gravity, just as Einstein had predicted theoretically in his first expressions of the Unified Field Theory. In other words, what Brown needed now were those “practical inventions” that would clearly demonstrate that his ideas were in fact more substantial than the flawed ruminations of an erstwhile young scientist. Mars may have been much farther off than “a few years,” but that did not deter the young man from pursuing the task at hand, to find a mechanism that would irrefutably demonstrate the phenomenon he had observed in his X-ray tube. But even as his ideas were being picked up on the wire services and printed as far away as New York, Brown was still mired in the rejection of disparaging classmates and faculty at Cal-Tech. So it is no wonder that, with the end of the spring term, he packed up all his gear and returned to the relative safety of his home and family in Zanesville and, the following fall, resumed his studies on the campus of Denison University in Granville, where he solicited the counsel of the resident professor of Astronomy, Dr. Paul Alfred Biefeld.